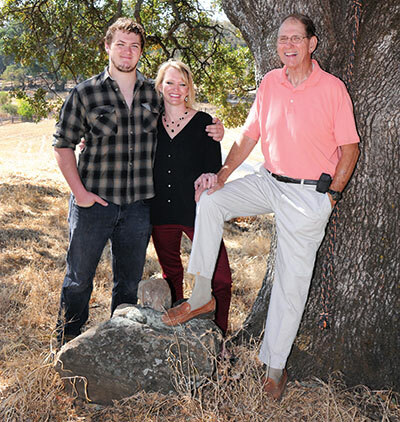 Mark Hanneman, right, is grateful his grandson Zac Correia and daughter Dawn Hanneman, R.N., knew what to do when his chest pain began. Mark Hanneman was sheering sheep with his grandson, Zac Correia, when the chest pain started. It was a hot and dusty day in June 2014 and as they wrestled with the sheep he thought the pain meant he was becoming dehydrated. Healthy and strong at age 71, it never occurred to him that he might be having a heart attack. Retired after 21 years as an Air Force navigator, followed by 20 years at Explosive Technology, he was enjoying life in the country. The quicker you can get help, the better your outcome will be. Call 9-1-1 and request an ambulance. Dawn, the emergency services clinical manager at NorthBay Medical Center, feared her dad was more than dehydrated. And when it comes to hearts—time is muscle. The quicker you can get help, the better your outcome will be. And the best way to get help is to call 9-1-1 and request an ambulance. Medic Ambulance rushed Mark to NorthBay Medical Center, which is both an accredited Chest Pain Center and a STEMI (heart attack) receiving center. By the time he reached the hospital, the results of his EKG were already in the hands of an emergency room physician and a Code STEMI had been called. The code alerts the cardiac catheterization team and interventional cardiologist to prepare for an emergency patient. Interventional Cardiologist Cyrus Mancherje took Mark to the cardiac catheterization lab where he diagnosed Mark with blocked arteries and began the procedure to open them. But within minutes, Mark suffered a cardiac arrest and required an electric shock to return his heart to a normal rhythm. Once he was stable, the doctor completed the procedure and Mark had two new stents keeping his arteries open. “When I woke up, Dr. Mancherje was still working. He turned the computer screens my way and explained what he had done, showing me before and after images of my blocked arteries,” Mark says. Not five minutes later, Mark’s chest pain returned fast and strong. The nurses were shifting him to a bed, but they quickly read his EKG and knew something was wrong. In the minutes following his cardiac catheterization, a blood clot had formed and caught in one of the new stents, shutting off blood to his heart and causing Mark’s intense pain. Dr. Mancherje immediately began a second catheterization, removing the blood clot and adding a third stent. From the time Mark entered the hospital, to the exact time his arteries were cleared, was 36 minutes. Three days later, Mark walked out of the hospital to begin his recovery. He was referred to the Cardiac Rehabilitation Program at NorthBay Medical Center and he and his wife of 48 years, Wilma, decided to participate together. Wilma, 70, had undergone open heart surgery 10 years before and Mark worried more about her health than his own. Now, more than a year later, he has made a full recovery. And, in addition to his repaired arteries, he has a second reason to be grateful to Dr. Mancherje. If you experience any one of the following symptoms for more than five minutes, call 9-1-1. You could be having a heart attack. Tightness or discomfort in the center of the chest. Sometimes described as pressure, aching, burning, numbness, or a squeezing sensation. Pain or discomfort in the upper body, including left shoulder, back, neck, jaw or stomach. Light-headedness, dizziness, extreme weakness or anxiety. Pain in the upper back or shoulder. Unusual fatigue for several days.